And one would be incorrect. And, you know, the thing about Patrick Stewart, what makes him so infinitely watchable, is the fact that whenever a character of his has a supremely difficult moment, you know that it’s coming from a real place inside of him, and yet it is also very dignified. And I don’t mean “dignified” as in “uptight.” I mean that Patrick Stewart has freaking dignity, man. A single half-smile from Stewart is more profound than an entire lifetime of shenanigans from most of Hollywood. And there are reasons for that, reasons that have to do with his talent, and reasons that, I realize now, must have so much to do with what he lived through. 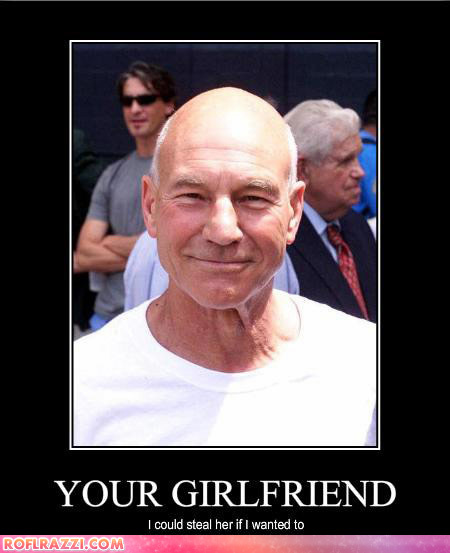 Patrick Stewart, I salute you. He most likely could, dudes. He most likely could. I can’t argue with that, sci-fi fantasy LARP geek that I am. For you young things, that’s what we old (as in thirty-something) people did before they invented “Warcrack”. We got dressed up in our fantasy costumes and went out in the bush and chased REAL opponents around with wooden swords and so on. I know its blasphemous,but I perfer the likes of Takei and Nimoy. OOO! The original generation! That’s not blasphemy, it’s PROTO geek-culture! And it’s glorious! *Sighs* Does anyone know if he’s married? Says the Janeway fan..
Well, he does talk about his girlfriend in the piece I link to.